This is the second article of a two-part profile on the Norton grape. This article discusses Norton winemaking techniques, research into its genetic origins and the history of the variety. The first Norton article in Midwest Wine Press focused on characteristics of today’s Norton and included a report on the 2012 harvest. Many winemakers are not surprised their Norton fruit is in good shape this year despite temperature fluctuations that were erratic, even by Midwestern standards. Norton is exceptionally well-adapted to the extreme cold, heat and humidity of the Midwest. Some grape growers say it can be tough to get Norton vines established, but once they start to mature, the vines are very vigorous and there are reports of Norton reaching heights of ten meters! However, regardless of how vigorous and well adapted Norton is, it can be difficult to make into quality wine. 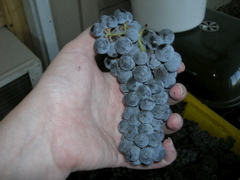 Carbonic maceration, a winemaking technique in which grapes are fermented whole – rather than being crushed first – in a carbon-dioxide rich environment, can also be used to knock out acidic tartness. It’s a technique that’s being used to make Norton by Chrysalis Vineyards in Virginia. Paul Roberts, Norton enthusiast and winemaker at Deep Creek Cellars in Maryland, says one of the best Norton wines he’s ever tasted was produced experimentally with carbonic maceration by Chrysalis. Another challenge with Norton is the juice content which is less than other grapes. Jacob Holman, a winemaker at Les Bourgeois Vineyards, who also hosts Norton Workshops as President of Missouri Wine Technical Group, says a method he uses to boost the juice quantity is reverse bleeding. This is the opposite of a French technique called saignée, a technique of bleeding off the juice after crushing the grapes to reduce the liquid content of very juicy grapes. Holman does the opposite and holds back some of the Norton juice from fermentation and then adds it later to increase the liquid content. Norton winemakers use either American or European oak. Tim Puchta, from Adam Puchta Winery, also in Hermann, Missouri says he prefers American oak because it is better suited to complementing the powerful flavors of the Norton grape. Norton grapes. Photo courtesy Jowler Creek Vineyard. Norton’s small berry size and the tendency of many growers to reduce the number of grape clusters per vine to maximize fruit quality means yields at harvest time are usually less than yields for other varieties. According to the report, Crop Profile for Grapes in Missouri, by G. S. Smith and S. A. Becker, the average yield for Norton grapes in Missouri is 3.5 tons per acre compared to 6-8 tons per acre for French-American hybrid grapes. Danene Beedle, Marketing Director for the Missouri Wine and Grape Board describes Norton as ‘a true American grape varietal.” For many other hybrid varieties bred from European and American grapes, like Chambourcin and Seyval Blanc, the French hybridizers sought to emulate the old world grape flavors. By contrast, the Norton hybrid, developed by Virginia grape breeder Daniel Norton in about 1820 is thought to be predominantly derived from the North American species Vitis aestivalis. Norton’s discovery of the new species was a breakthrough for American winemakers east of the Rockies because it was a grape that could survive the extreme climate and make quality dry wine. However, the Norton grape’s exact genetic origins remain a mystery. One grape enthusiast to come up with a theory explaining Norton’s family tree is Cliff Ambers, winemaker and grape-breeder at Chateau Z Vineyard in Virginia. After ten years hybridizing different species of wild American grapes, Ambers has proposed a breeding “formula” for the Norton grape. He says one of the missing ‘parents” of the grape could be the American variety, Vitis cinerea, but might also involve Vitis labrusca and/or Vitis cordifolia. The details of his research are to be unveiled in an upcoming issue of the UK’s Journal of Wine Research. Norton’s brazen words later proved prophetic. When the phylloxera virus struck the ‘trashy” French wine industry, Norton root-stock from the Midwest was used to improve the French vinifera’s disease resistance and saved the industry. In Missouri, Norton became a cornerstone of a burgeoning U.S. wine industry. In The Wild Vine, Kliman writes that by the 1860s, Missouri was the number one grape growing state. By the late 1800s Missouri had up to 7,000 acres of vines – according to an estimate based on limited records by the Missouri Wine and Grape Board. By comparison, Missouri Wine says 1,700 acres of vines grow in Missouri today. Norton achieved world-wide fame in 1873 when a Stone Hill Winery Norton won a gold medal at an international wine competition in Vienna. However, by the early 20th century, Missouri’s wine industry and its production of Norton wine were in steep decline. Kliman says one main reason was cheap competition: “Growers in California could produce a pound of grapes at half the cost of a pound in Missouri.” Then in 1919, Prohibition destroyed the Missouri wine industry. In the late 1960s, Norton began a slow comeback that Kliman describes as ‘Norton’s return from the dead.” He says Missouri’s Stone Hill Winery, and later Virginia’s Horton Winery and Chrysalis Vineyards, led Norton’s resurgence. Missouri winemakers are still waiting for that day but they have reason to be optimistic. The amount of Norton under cultivation continues to increase in Missouri where Norton acreage is up more than 20% in the last five years, according to Missouri Wine. More importantly, local winemakers and enthusiasts say the number of wineries making quality Nortons has risen significantly. Some of the “dark knight’s” good deeds in 2012 are listed below. Thanks to Cliff Ambers, grape-breeder at Chateau Z Vineyard; Boris Bauer, ‘Norton Wine Traveler’ ; and Paul Roberts, author and winemaker at Deep Creek Cellars, for information and inspiration that helped write this article. Award Winning Nortons in 2012. For a full list of 2012 Norton winners compiled by the Missouri Wine and Grape Board click here. I gave an elderly friend of mine from Baton Rouge a bottle of 1999 Stone Hill Norton. I asked him to give me honest opinion. If he didn’t care for it, it certainly wouldn’t hurt my feelings. He has about 3000 bottles in his cellar and his wine friends regularly share $1000 bottle French wines with him. He called me after one of their wine tastings and told me that he served the Norton to his friends. He said being an oenophile he was familiar with the the Norton history, but had never actually tried it. He served the Norton from a decanter to his wine friends for a true unbiased opinion. He said they all thought the unknown deep red wine was one of the best ever served and everyone was shocked to find that it came from Missouri! Thanks for sharing your Norton experience. It’s an amazing wine that few people know about. In terms of aging Norton, I have been told that 3-4 years is about as long as you want to go. There are not a lot of tannins in Norton so it’s not going to soften much after extensive cellaring.